Retin-A itself does not really improve acne scars. Retin A (it contains Tretinoin) has the most dramatic effect on severely sun damaged skin, pigmentations and acne, to certain extent on wrinkles and loss of elasticity and it helps to soften hardened scars (from surgery, stretchmarks etc.) but it does not fill in the scar. Microneedling on the contrary often fills in the scar or at least partially. Buy a 1.5 mm dermastamp with 35 needles. You do not have to stamp all scars in one session. You can stamp one cheek, do it very thoroughly, let it heal and stamp the other. Scars can rarely be completely removed but they can be improved and make less visible and less indented. For ice pick scars, buy a 1.5 mm dermstamp with 35 needles. If they are really deep, buy a 2 mm dermastamp (if you are a beginner, better to start with a 1.5). Stamp every three weeks. If you have pigmentation problems, such as post acne spots or uneven skin tone, buy a regular 0.5 mm dermaroller and roll up to three times a week. Apply a little of our Infadolan ointment right after stamping. If you are prone to acne, apply it only for one day. >2. Do I use a dermaroller or dermastamp (or both)? For the size and shape of your hypopigmeted patch, a 1 mm dermastamp would be better but you can use both. Use a dermastamp to stamp the scar and a dermaroller (roll with very light pressure) for melanocytes transfer. A dermastamp would be sufficient for the transfer but since you have already bough a roller, use it as well. You should stamp the white patch and also a little over the edges of the white patch to facilitate the migration of melanocytes from the surrounding normal skin into the white patch. >there is no scar tissue so I am wondering if shorter needles are preferable? A 1.5 mm size is useful if there is scar tissue or on the skin that is very thick (a knee skin hypopigmentation etc). For hypopigmetation without scarring, a 0.5 or a 1 mm dermastamps are suitable. >4. How often should I roll or stamp? I seem to recall you typically suggest every 20 >days (going over the patch about 8 times per treatment). This means I would not use it >daily as the dermaroller website suggests. Stamp it every ten days. >5. Lastly, to get the fully benefit of any possible melanocyte cell transfer, do you have >any special techniques that I should use? Do I roll or stamp over another part of my >body first? Or just roll and stamp in the general area? I am not quite sure. You should roll over the patch, going up and down, to the areas that are normally pigmented and back to the patch. You can also roll over an area of you body that you know tans very easily and then roll on the patch. Do it many times during the same session. I cannot promise you a complete restoration of the pigment. Lasers work by heating up the skin and that sometimes results in destroyed or impaired function of melanocytes (pigment producing cells). I recommend you a regular 0.5 mm dermaroller (roll up to three times a week). If you feel that your hyperpigmented edges are getting worse after dermarolling (temporary redness or darker skin is normal), buy a 1 mm dermastamp and stamp only the depigmented skin (do not touch the hyperpigmented edges). Concerning the stretch marks, if you do not have way too many, you should buy our single needle (we soon have them in stock) and needle only the stretch marks. When the skin is healed from microneedling, expose your hypopigmentation to the sun because melanin is produced as a reaction to UV (provided there are melanocyte cells in the area to produce it). When you are going to tan your hypopigmented areas, apply a high factor UV cream just to your hyperpigmetnation. You can apply it for example with a small cosmetic brush or use those cotton sticks that are sold to clean ears. Or buy a baby diaper rash cream containing zinc oxide and apply a lot to the hyperpigmented areas prior to the sun exposure. Zinc oxide reflects the UV. Your hypopigmentation needs sun and your hyperpigmentation must be protected from the sun. I know it is not easy..
For the hyperpigmentaion, continue with Tretinoin. If you are unlucky and microneedling will not permanently improve your pigmentation, you can at least stamp the scar prior to those occasions when you want to wear cloting with a low décolleté. Stamping will make the scar less visible. Whether the improvement is going to be temporary or permanent is individual. Not everybody's skin reacts the same, unfortunately. You should stamp your scar every three weeks. If it heals OK, add more stampings the next session. There is no need for aggressive stamping in your case. Aggressive stamping/needling is useful in case of scars that contain hardened collagen scar tissue, which is often the case in surgery scars or stretch marks but your scar is just a little rough and the hyperpigmentation is the main problem. You can also stamp lightly, every two weeks. In case of pigmentations, more frequent, light approach is better. However, I recommend stamping to smoothe down the scar. I am not sure microneedling will improve the pigmentation because you are obviously prone to hyperpigmentation. For the pigmentation, a hydroquinone cream or a Tretinoin cream are a good choice. It is very nice to hear microneedling and the A-Ret works for you. Would you mind telling us some details? What skin condition have you been rolling for and what exactly improved? Hydrosols are a by-product of the production of essential oils. They contain tiny droplets of essential oils but I am not sure whether this is enough to keep the skin moisturized after microneedling. They are more suitable as a refreshing toner. You can try it and see whether it keeps the skin from drying out. It also depends what needle length you use. The longer the needles, the more protection and moisturizing you require. Shea butter is suitable; it is supposedly just a very mild anti-inflammatory so that is OK. Even though I try, I, cannot always answer forum postings the same day. I do not think it is a good idea to needle a serious acne cyst. The cyst should first heal and then you can needle the pigmentation or the scar that will be left. Respectively, needle it only if nothing else helps. You could perhaps try an OTC topical antibiotic cream or you can try our 0.1% Tretinoin cream but it will make the cyst temporarily much redder. Tretinoin speeds up the turnover of the skin and this could provoke the cyst into a kind of "healing" response, however Tretinoin also sometimes make acne initially worse before it makes it better. You could also try a topical nonsteroidal anti-inflammatory, containing for example ibuprofen. Buy NUROFEN rapid capsules or NAPROXEN capsules and pierce them. They both contain a nonsteroidal anti-inflammatory subtance. If the cyst is infected, buy Betadine liquid or Betadine cream. It contains povidone-iodine, a powerful disinfection. Cortisone suppresses inflammation by suppressing the impairing the immune system and this can indeed interfere with healing. Cortisone injections can also result in indentation of the skin. Try our 0.1% Tretinoin cream on your hyperpigmented scar. Tretinoin improves hyperpigmentation but you have to apply it long term. A cream with hydroquinone should also help. For your shallow scars on the cheeks and the lines around the mouth, buy a 1 mm or a 1.5 mm dermastamp. Do a test patch first to see whether your skin ends up hyperpigmented. Redness for many days after stamping is completely normal though. If your skin reacts OK to stamping, you can try to stamp your forehead scar to make it smoother but do not perform any aggressive stamping. Start very slowly on a small part of the scar to see what happens. No, a dermaroller will not help with dry, flaky skin. Dry skin is not caused by lack of water - it is caused by excessive evaporation of water from the skin. The natural skin barrier that should prevent evaporation doesn't work properly. Supplying dry skin with hydrating creams doesn't work. It needs some fats to keep the moisture in. In fact, hydrating creams saturate the skin surface with water which makes the skin look temporarily better but this very temporary hydration actually increases the evaporation of water from the skin! Adding water does not solve dry skin. Establishing a barrier that prevents water evaporation solves it. That is why oils are much better moisturizers than any light moisturizing cream because oils form a film on the skin that prevents the evaporation of water. The film however can be a problem with acne-prone skin. I use almond oil to clean and moisturize my skin. I slightly wet a cotton pad with tap water, add almond oil and clean my face. Almond oil will keep the skin moist and supple by preventing the evaporation of water from the skin. I also apply almond oil on my body (while the skin is still wet) after a bath. I keep a bottle of almond oil in the fridge and refill a small container that I keep in the bathroom. From time to time I use fine salt in the shower for exfoliation but do not exfoliate too frequently. Can you please tell me a bit more about this scar. How did you get it and how old is the scar? Has it always been dark like this? Is it getting lighter over time? Are you prone to get hyperpigmentations? Did you expose your skin to the sun right after or shortly after dermarolling without sun protection? None of our products help with this kind of redness. Certain products we offer can help with pigmentation but the type of pigmentation that is caused by skin pigment melanin - age spots, sun spots etc. Buy an anti-inflammatory cream (not with steroids), containing acetylsalicylic acid or for example ibuprofen or diclofenac and apply it on your cheeks. Or buy NUROFEN rapid capsules or NAPROXEN capsules and pierce them. They both contain a nonsteroidal anti-inflammatory subtance. Available OTC. Write me again in about two weeks to say whether it got better. If it doesn't help, buy an anti-inflammatory cream with steroids. Some of them are OTC. Dr. Roller is a high quality roller - the best in fact, we also sell them. Yes, I think the redness will disappear but the creams will hopefully speed it up. Dermarolling / Microneedling / Re: "do not reuse"
Certainly you can do that. The manufacturer simply covers their bases legally, since if they implicitly endorse reuse they may be legally liable when a practitioner uses a roller on a HIV-positive person and an hour later uses it on another person. There is absolutely no reason why you can't reuse your own roller or why you can't sterilize it, except that autoclaving would of course melt the plastic. So this disclaimer is also just a way of avoiding claims of damaged rollers. Sterilization = using heat above the boiling point of water for a long time. Sterilization is something else than disinfection, which is what you should do with the roller, using alcohol or Chloramine-T. I think you can successfully soften the scars with microneedling. The scars will never completely disappear but they will become less visible and much better in texture. Stamp the scars every four weeks with the 1.5 mm dermastamp. You do not have to stamp all scars in one session. You can spread it out to several sessions but stamp thoroughly. At your first session, do not stamp densely, do just a small part of a scar and do it lightly to see how the skin heals. It may stay red for a long time but that is OK. Yes, roll the scars twice a week with your 0.5 mm dermaroller. You should also use 0.1% Tretinoin cream and apply it on your scars right after stamping. Wait about five minutes and apply a little Infadolan on top of the Tretinoin. Apply Tretinoin to your scars also without stamping. Apply it every second or third day. Initially, it will make the skin red and dry so moisturize it with either Infadolan or some oil. Tretinoin helps but it has to be used long-term and it can make the skin red and a bit irritated so do not give up - continue. You can reduce the frequency of application if the skin gets too irritated. You can apply Tretinoin after rolling with the 0.5 mm but dermarolling greatly enhances absorption of skin products so it may make Tretinoin too irritating. If it does, apply it on the days when you do not roll. Do not use Tretinoin if pregnant, planning the pregnancy or breastfeeding. Please let us know how things are going for you after about four months. Skin pigment (melanin) is produced by melanocyte cells. They are at the bottom of the epidermis, which is only about 0.1 - 0.3 mm deep in the skin. When they produce too much melanin in certain area, you get hyperpigmentation, when they do not produce enough or are destroyed or damaged, you get hypopigmentation. Scar tissue differs from normal skin and one of the differences is that it has no or badly functioning pigmentation processes. Dermarolling often triggers melanocytes (pigment producing cells) or "wakes up" existing dormant melanocytes. In some cases the color turns completely back to normal (especially if there is hypopigmentation but no scar tissue, such as in Vitiligo for example) and in some cases the color improves but the scars remain still lighter than the surrounding skin. In your case, you have a scar and some very small parts of the scar are slightly raised. 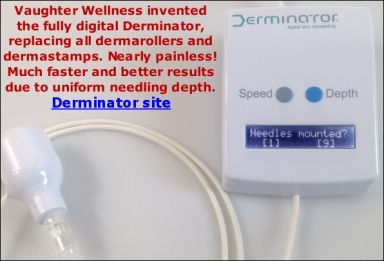 Use a 1.5 mm dermastamp with 35 needles and stamp the scar very densely every 15-20 days. For pigmentations, more frequent microneedling is suitable. Stamp the hypopigmented patches and also stamp slightly outside of its borders to enable the migration of the melanocytes from the surrounding normal skin into the hypo-pigmented areas.